Clean and nourish facial hair with the Proraso Beard Wash, a gentle yet effective cleanser. Producing a light, refreshing foam, it works to sweep away dirt and eliminate bad odours while conditioning hair for a soft, smooth finish. 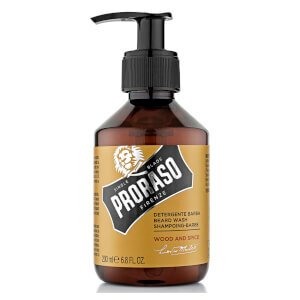 Featuring a warm, masculine ‘Wood and Spice’ scent, both skin and hair feel refreshed and balanced.